According to a report by Intuit, a quarter of all the US workers have worked remotely for at least a few hours every week. An increasing number of companies are allowing their employees to work remotely, and this is because organizations are more interested in the results rather than the number of hours employees work. In a previous post, we gave you 11 reasons to consider working remotely. 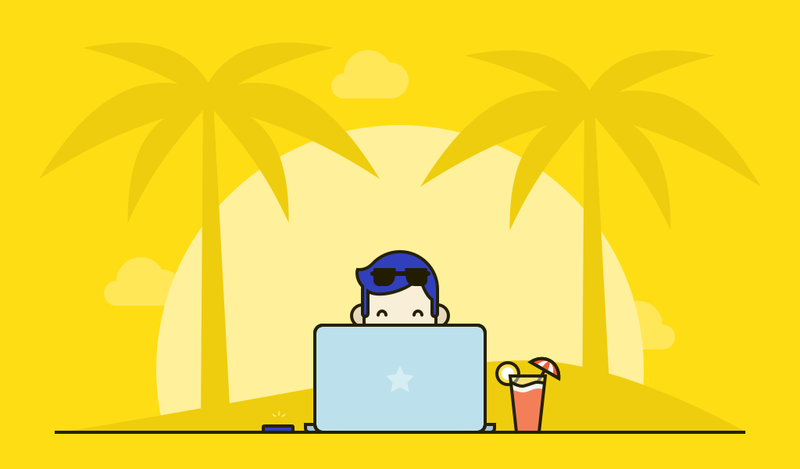 But, if you are still unsure about it, here are 10 ways remote teams actually work, with examples from some of the best remote teams out there! Imagine you are at work, sitting next to your colleagues. Of course, you are going to talk about work, but you are also going to talk about that great game last night and the latest episode of Game of Thrones. All that extra information gets short-circuited with remote work. Yes, you might still talk about sports or movies, but since you are on a phone or chatting, you want to be direct and to the point. All in all, it would take you half the time to discuss the same points. Automattic, the company that developed WordPress, is currently valued at over $1 billion, and it has about 400 employees spread across 40 different countries. They don’t work in the same office, nor do they share emails. Instead, they use an internal blog called P2 where everything is updated and the team members can check everything that is going on, without having to send each other emails. This is a major advantage of working with a remote team. We all know how dreadful it is to wake up hours before office time so you can get dressed and drive to the office. And, it almost feels unreal when you actually have time for breakfast! But, when you and your team members work remotely, you can use those extra hours to catch up on work. Why waste time in your car when you can directly get down to work? Treehouse is a company that teaches people how to code. With the help of 100 team members working remotely, the company gets an annual revenue of $8,000,000. Treehouse’s founder, Ryan Carson, understands that when you skip the commute, you save time and work more. This is why Treehouse employees only have a four-day work week. If there is one remarkable advantage of working on a remote team, then that is the ability to be able to focus on something without any distractions. And even if you find a specific location distracting, you can always move and work from somewhere else. inVision is a collaborative design software company. They have a remote team working from different parts of the world, and they like to give each team member his own space. But that does not mean the team does not collaborate. inVision makes sure there is, at least, a few hours of crossover time between all the team members. Don’t we all hate unnecessary meetings that could have been easily avoided? These are the same meetings that hog a lot of our time and interrupt our workflow. When working from an office, you can get dragged into plenty of unnecessary meetings. Now, when you work with a remote team, meetings become increasingly important, and all the team meetings are, or at least should be, well planned and prepared so everyone can make the most of it. However, some teams, like Glide Consulting rather move most meetings to a text based messaging platform. Some advantages are that it provides a record of everything and it forces you to think about what’s important, since explaining through text makes you think about all aspects of the topic. The main reason teams work remotely is because everyone is working from a different location and from a different time zone. While some people might think it can be a disadvantage, we believe that it’s a great advantage. Imagine, you have just come up with a campaign idea and you would love to show it to the client in the morning to get ahead of things, but it’s already late night and the design team can only start the work in morning. Now, if your designer was working from the other side of the world, you could send him the idea late at night and by the time you got up, the design would be ready to be delivered. Baremetrics specifically hires professional remote team members that can handle working remotely, are capable of problem solving, and get work done from different time zones. If we asked you, which is your special focus place where you get maximum work done, we are pretty sure your answer wouldn’t be the office. By working remotely, you would be working from a place where you can focus completely, and this would mean doing more work in much less time. Groove, a company that provides help desk software to other organizations, credits all their success to remote work. The company doesn’t want team members to stick to their desks, instead, they urge the team to find their own productive space. To achieve this, they conduct small meetings through chat every morning where each team member shares what they will be doing for the rest of the day. For remote teams, it’s essential to use the right tools to be in constant coordination and communication. This is where work management tools become essential. They make remote collaboration and communication easy. However your team might need other tools for video conferencing or other specific needs. Buffer, is another company with a large number of team members working remotely and the company makes sure that all of them are equipped with the right tools to help them work better. They use tools like Timezone, which lets them know which time-zone their team members are in. What do you get with a better team collaboration tool? More transparency. Using the right tools for your remote team means you no longer have to send individual emails in order to receive updates about each task. You can watch the progress right through your dashboard or quickly drop a direct message. The transparency also helps other team members stay in the loop and stay competitive. Because nobody likes being in the dark about what others are doing. Zapier, an app that connects other apps together to help users get more work done, has a large remote team and the company makes sure they maintain transparency to keep all of the team members in the loop. They use tools like Google Docs and Google Calendar. What happens when you skip the extra commute, work on your own schedule, and without any distractions? Your productivity sky rockets and you are now able to do the same job in less time. At the end of the day, that’s what we are all looking for. Time Doctor, a time management & productivity software company, is successful in keeping their remote teams coherent, productive and motivated for close to a decade using their virtual team management strategies. The main concern people have with remote teams is how they would know if the other members are even working or not? But, if you are using a reliable team management tool, you would never have to worry about that since there would be instant updates when tasks get finished before time and reminders when a deadline is missed. Help Scout, a customer support company, has a very successful remote team. Even though, most of the members work remotely, they have a Friday Frika tradition where each member has to talk to a randomly chosen member for at least 20-30 minutes. Working remotely helps you unplug from all the distractions and focus on your work. With the right resources and tools, you are guaranteed to see more success. Have you worked on a remote team? How was your experience?